Don't Tell 'til You Show? Does the writing rule "Show, don't tell?" apply to pregnancy? I believe that as with creative writing, it depends. The rule of thumb for a public announcement is to wait until 12 or 13 weeks, when you can be reasonably certain the pregnancy will be a success. The likelihood that you will miscarry early (or anytime) depends on many factors, such as your health history, your family history, and your age. If you have few miscarriages in your family (and the babydaddy's--iffy sperm can result in genetic errors) and you and the babydaddy are young and healthy (eating right, not smoking, drinking, or taking prescriptions), then you are probably in the clear. Of course, no pregnancy is ever a hundred percent certain, so you must take into account the possibility that you may not, actually, be having a baby on your due date. However, there are many reasons you may want to tell early anyway. If you are comfortable sharing a potential miscarriage with others, there is probably no reason to hold back. If you are busting at the seams--emotionally or physically--it might be healthier for you to just spill! By 15 weeks (top picture in this post), I was in maternity clothes. I was never destined to end up on that "I Didn't Know I Was Pregnant Until the Baby Fell Out" show. Theoretically, I could have concealed my condition better with different clothing. But the styles I tend to wear are nipped in or snug at the waist, so it would have been suspicious. And then there were the numerous weekday doctor appointments, the sudden inability for me to drink my morning coffee, and the frequent trips to the restroom that tipped off my superiors at work. By the time I told my boss only a few weeks into my pregnancy, she laughed and said, "I knew it!" So I had difficulty keeping the secret for very long (though I didn't make an online announcement until 14 weeks), but I found that there were many benefits to setting the cat free early on. My boss was happy to be flexible with my schedule for prenatal visits. I didn't have to worry my family and friends with my queasiness and low energy in the first trimester. And, as I wrote about in a post while I was pregnant, I found that people were a lot nicer to me when they knew I was pregnant. Instead of being discreet, I started wearing clothes that emphasized my condition and bringing it up in conversation. Loved ones and complete strangers shared my joy, and everyone treated me with a little more loving kindness and understanding--things you can't get enough of in the first trimester of a pregnancy. So follow your gut on this one--your intuition-gut and your, you know, belly gut. Some women don't show outward signs of pregnancy for a long time, so they have the freedom to choose a longer wait. And some women don't want to, either way. It's the Century of Oversharing, after all. Do what feels right--just make sure your mom and your boss aren't the last to know! Stop by on the first Friday Monday of the month for more Middle Path Mother posts on pregnancy and motherhood. this was so helpful for me. i'm an early shower, almost 9 weeks and i have a gut and frequent nausea/exhaustion/food aversions. it's hard to keep it a secret. i told my family and then my friends, because it's obvious all around just from looking at me. 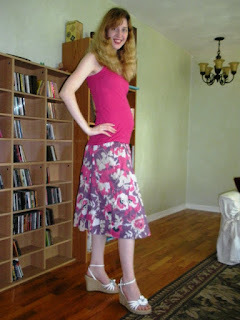 i am worried about miscarriage, but i'm comfortable sharing if it DID happen. i'm 24 and in decent health, dad to be is 29 and a healthy dude as well so i'm hoping all goes well :) thank you so much again! Congratulations, Alex! 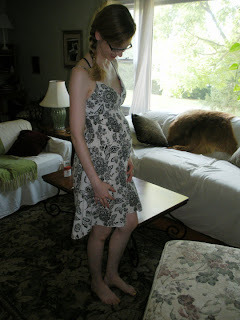 Wishing you lots of loving support and a more comfortable second trimester. (It gets better soon!) P.S. Love the sunglasses in your pic.